The iconic National Historic Landmark located at 281 Front Street is getting a long-awaited facelift, with the same master mason who was tasked with the work more than 25 years ago, when the Custom House was leased to Key West Art & Historical Society for use as a museum and required a full restoration. 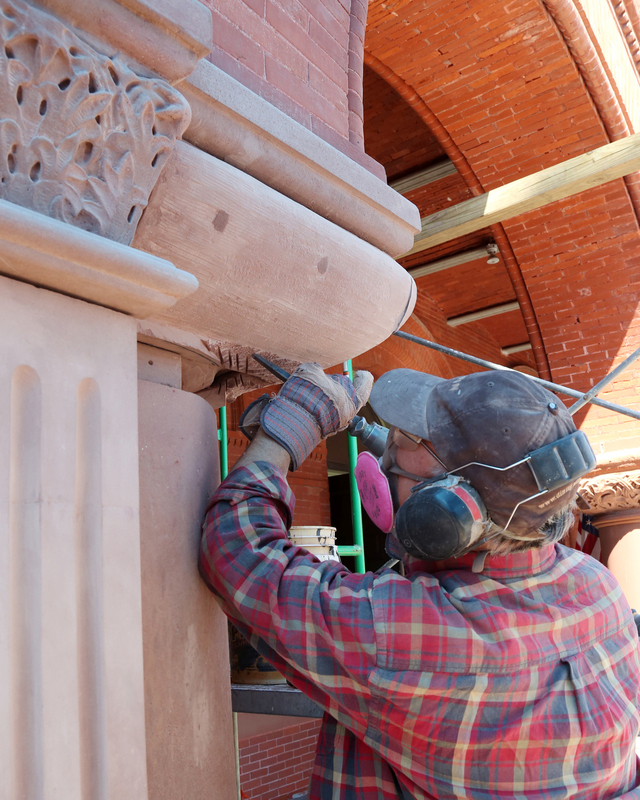 For the last three weeks, armed with hand and pneumatic chisels, a mallet, and an air hammer, master masonry carver Randall Nelson has carefully replicated and repaired the intricate designs of the 127-year-old Richardsonian Revival building to recreate the feel of the past. The original 9-year, 9-million-dollar restoration project spearheaded by The Society with the help of late philanthropist Scotti Merrill and the island community in 1992 was daunting but necessary. Once a touchstone for the island’s lucrative trade routes and maritime industries as well as government offices, it had fallen into derelict condition after decades of abandonment. While masonry efforts began during the original restoration, the job was never completed due to fund depletion. With the foresight and dedication of the organization’s current administration, the final phase of the long-awaited masonry restoration actually began more than 18 months ago, and included the manufacture of molds made from existing tile and bricks as well as full analysis of original mortar samples which were identified by David Salay and Bert Bender of Bender & Associates architects, P.A., and Kelly Perkins and Enid Torregrosa from the City of Key West’s Historic Architectural Review Commission (HARC) in order to match the color and texture of the newly manufactured mortar to the old. 1,000 bricks, 200 terracotta tiles, two pallets of mortar, and approximately five tons of stone arrived in Key West in January. In addition to Nelson’s efforts, masonry repairs include replacing the capstones on the guardrail sections between the archways, repointing significant sections of mortar, rebuilding deteriorated arches, building new stone railings, replicating terra cotta components, and repairing the columns at the majestic building’s entrance, all under project management of Nick Olson of Specialty Property Services, a Tampa-based company that also did the museum’s second story window restorations in 2014. The project, estimated at $350K-$400K and funded by State of Florida Department of Historical Resources, Monroe County Tourist Development Council, Monroe County Board of County Commissioners, Old Island Restoration Foundation, and Dogwood Foundation, is expected to be completed late this spring. “It may have taken 20 years, but we’re getting it done,” says Gieda. For more information, contact Executive Director Michael Geida, at 305.295.6616, x101. Your Museums. Your Community. It takes an Island.